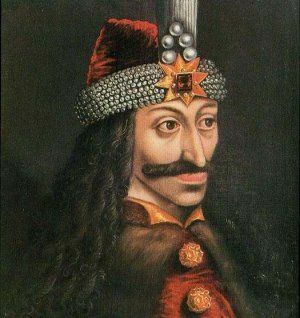 I'm wondering if you ever heard about Vlad Tepes (Vlad the Impaler), the Romanian Voivode, the real personality beyond "Dracula" Legend? Vlad Tepes, Romanian Voivode, known abroad nowadays mostly as Vlad the Impaler or Dracula (due to the novel of an unknown author till then, Bram Stoker, whom dare to distorted the history reality but, in a way, served to actual tourism purposes) was a prince over "Tara Romaneasca" region (Wallachia), around 1448, very tough personality, decided to extinct the spoiled local traders stealing from citizens and state, mid and high class exploitation, thieves, traitors and Turkish servants. Let's find out a bit more about Dracula or Vlad Tepes history and the personality behind the Legend! Vlad III, Prince of Wallachia between 1431 and 1476, also known as Dracula and Vlad the Impaler was for 3 times Voivode of Wallachia (former country in Romania), ruling mainly from 1456 to 1462, the beginning of Ottoman conquest over Balkans. His father was a member of the "Order of the Dragon" (Dracul) and Dracula means "son of the Dragon" to indicate his father’s title within that Order. Vlad III is remembered for spending much of his rule campaigning efforts against the Ottoman Empire and its expansion, and for the impaling of enemies. The name of the vampire Count Dracula in Bram Stoker’s 1897 novel Dracula was inspired by Vlad’s patronymic. Thomas Paine quote about being brave - "I love the man that can smile in trouble, that can gather strength from distress, and grow brave by reflection". Bran Castle (standard.co.uk) - To eradicate all those bad habits Vlad Tepes did opt for an extremely cruel action with immediate effect – the result was perfect, but just for a short period of time, cause local high class betrayed him making alliance with Turks and kill him in 1476 (in a coward way, depicting his head from behind). Vlad Tepes’ Castle did exist, at Targoviste, far from what Stocker described in his novel, 150 years ago, but to follow the legend, for commercial and tourist reasons in last 50 years they’ve liked to create a “Dracula Castle” at Bran (near Brasov, Romania). Yet no historical document proofs that Vlad ruled or lived inside Bran Castle (in fact old Fortress for merchants built at the main crossing custom point of that region and roads knot). Romania needed such a guy right after Revolution, in 1989! Romanian simple citizens life could be much different at this moment, eventually, close to Austria or Sweden level! Wondering is was better at Dracula (Vlad Tepes – Vlad The Impaler) time or nowadays!? Buuuuuuuuuut, it seems that life is always bright pink in a small secluded corner and not easy accessible; we just have to go across Daedalus’ Labyrinth, without Ariadna’s helping hand for finding it, isn’t it!? What do you think about Vlad Tepes? Would be Dracula - Vlad Tepes an interesting character nowadays?